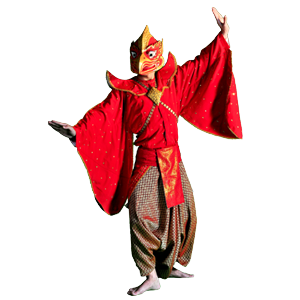 The Lao Ramayana differs from the original Indian version of the Ramayana. 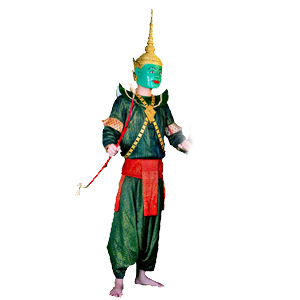 The Ramayana reached Laos late, around the sixteenth century, brought by Buddhist missions. The original Indian epic adapted to the geography, names of figures and regional languages. 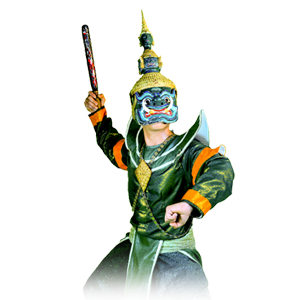 Consequently, all the story in the Lao Ramayana is situated in the valley of the Mekong, the grand royal city is called Chanthabouri Si Sattanak, while Lanka remains an island far from the heart of the kingdom, inaccessible and dangerous. transformed the God of the Aryas into the King of the Devas, then into a minor king supplanted by Vishnu and Shiva. The iconography reduced him to a god-like figure with human characteristics which sits astride the elephant Airivata (visible on the walls of Vat Phu in Champasak in the south of Laos). In the story of Phralak Phralam, he confers his powers to Thotsakhan (see the episode on Mount Maru). 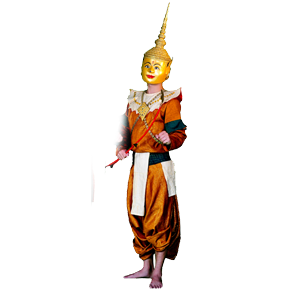 Phralak is the brother of Phralam who out of devotion accompanies Phralam during Phralam’s wife’s exile. In the course of freeing Nang Sida, Phralam’s wife, Phralak is tricked by Totsakhan, and he is not able to prevent Nang Sida’s kidnapping. He takes part in the battle beside Phralam and helps to destroy the Palace of Lanka which the giants (Niaks) have been occupying with their perfidious leader Thotsakhan. One day, the monks of Vat Savathi, near Muang Phalansi, gather after listening to Buddha tell them a long story of the two brothers called Phralam and Phralak. 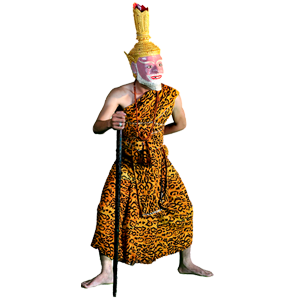 Phralam (Rāma) is a real or mythical king of ancient India. The Rāmāyana was committed to writing many tens of centuries after the supposed reign of Rāma, probably around the beginning of Christian era. In Hinduism, Rāma is considered as the seventh reincarnation of the god Vishnu. He is the image of a perfect man and is adored in the same way as his companion Hanuman, faithfulness incarnate, the monkey god, who aids him in his adventures. 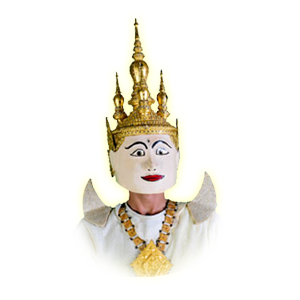 In the Lao version of the Ramayana, Nang Sida is the daughter of Nang Chantha and Hapkhanasouane. Nang Sida knows however that she is a reincarnation of Nang Soudsada, wife and celestial queen among the 240 million concubines of Indra. She undertakes to get revenge on Thotsakhan. She tries from infancy to kill him. When she is adult, her beauty is so great that she struggles to resist the intentions of Thotsakhan. She undertakes to prove her pure love for Phralam and becomes the symbol of deep and faithful love. Chalunsi is an anchorite living in a cave, and he raises Nang Sida and educates her. With his powers he constructs a magic arc to find between many suitors of her, which one possess a pure heart. Most of them will not succeed to pick it up, neither to bend the arc. Only Phralam succeeds in taking her to his palace, to marry her. attacks from other celestial or magical creatures. In his arrogance, Thotsakhan forgets to ask to be protected from humans. Thotsakhan captures and imprisons Nang Sida, Phralam’s wife. Phralam and Phralak, with the aide of Hanuman and his army of monkeys, leads and army composed of men and animals, destined to destroy Thotsakhn and to free Nang Sida. Lord of the Monkeys, son of Vayu or of Pawan, and the god of the wind in the Indian epic, Hanuman has the appearance of a white monkey and is the size of a man. 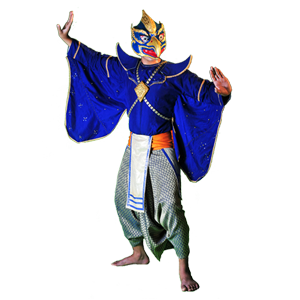 In the Lao Ramayana, he is the son of Nang Phengsi (turned into a female monkey) and of Phralam, who was also transformed into a monkey at that time. Following Phralam, he takes messages from Phralam to his love Nang Sida, who is imprisoned in the floating palace of Lanka. Son of humans in the Indian epic, he returns to his natural appearance at the end of the story. Big brother of Jatayu, guardian of the mountains that face the island of Lanka. Angered by the army of Phralam, he attacks. Phralam tells him of the fighting started by Jatayu with Thotsakhan. Samphathi is angered by this story, and decides to avenge his brother Jatayu. Being old, and too weak for fighting, he promises to Hanuman to fly to the kingdom of Lanka with Hanuman on his back. Jatayu, king of the khouts (vultures), about 60,000 years old, is the guardian of the laws of the forest. Faithful to Phralam, during the flight that takes Nang Sida captive to Lanka Island, he recognizes her and then he confronts Thotsakhan. During the confrontation, Jatayu loses his wings and falls into a forest. Phralam finds him and repairs his swings. Then Phragna Khout tells Phralam of the kidnapping of Nang Sida by Thotsakhan and gives Phralam her ring.